NEW YORK (CBS/AP) If you take in a few Broadway shows around Times Square you're bound to come across a few good heroines on stage. But on Thursday, authorities said that right in the shadow of the Times Square theater district, they've busted up an entire heroin ring - in the form of a drug mill worth millions of dollars. Investigators who raided a West 43rd Street apartment Wednesday found 28 pounds of heroin worth about $6.5 million - in 250,000 small envelopes, with workers busily packing the drug for sale, said the office of city Special Narcotics Prosecutor Bridget G. Brennan, the Drug Enforcement Administration and other agencies. "If our investigators were surprised by the location, you can only imagine the shock of neighbors, commuters and theatergoers," Brennan said in a release. The ring was operating in a newly renovated, nearly $4,000-a-month apartment two blocks from Times Square. Investigators began watching the place days ago as part of a broader investigation into heroin mills, the prosecutor's office said. 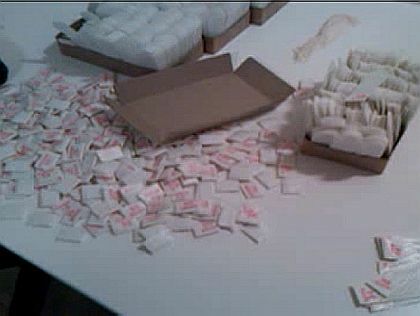 When authorities searched the apartment, investigators found piles of loose heroin, bundles of cash, coffee grinders used to dilute the drug and glassine envelopes stamped with underground brand names such as King Kong and 95 South, an apparent reference to Interstate 95, authorities said. Three men and a woman were awaiting arraignment on high-level drug-possession charges. Three of the suspects were arrested in the apartment or a nearby courtyard where they tried to hide, while the fourth was stopped driving away in a car with a garbage bag full of heroin-packing paraphernalia, authorities said.